The CPV firm reports 41.4 percent efficiency on production cells as it seeks DOE loans and venture funding. Here's a quick update on concentrating photovoltaics (CPV) startup Solar Junction. Just a month after making an announcement about a 40.9 percent efficiency multi-junction production cell, the startup has announced an NREL-validated value of 41.4 percent on a production cell. Modest gains in CPV cell efficiency can translate to significant reduction in levelized cost of energy (LCOE) -- so the increase is not trivial and bodes well for continued progress for the startup and the CPV industry as a whole. And half a percentage point is not even that modest. Additionally, the firm is on a short list of finalists chosen for post-selection due diligence within the Department of Energy’s (DOE) Loan Guarantee Program (LGP). The loan would support construction of Solar Junction’s 250-megawatt capacity manufacturing facility in San Jose, California. Solar Junction expects to begin shipping commercial cells this year. CEO Jim Weldon made an appearance last month at an IBF/Cleanedge venture capital event in Palm Springs -- a possible indication that the firm is in the market for further VC funding. 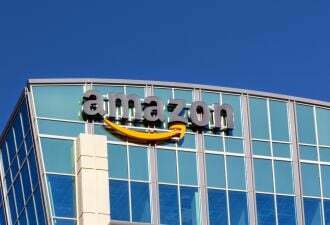 This was confirmed by GreenEnergy Reporter, which reported that the startup has hired an investment bank to help raise cash. Typically, DOE loan guarantees require a parallel amount of venture funding. 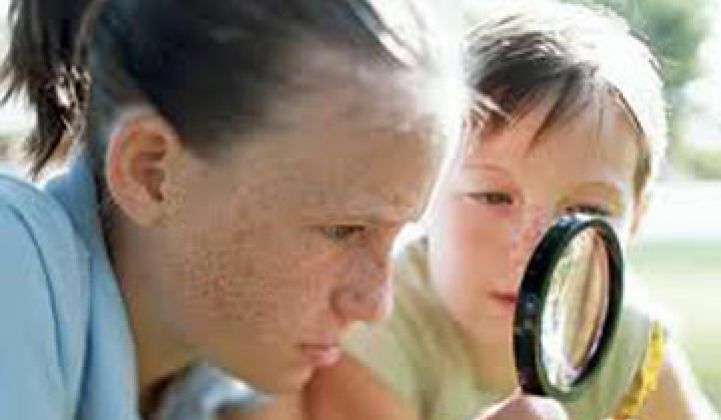 2011 could be the year that concentrating photovoltaics break through. Finally. There is a backlog of CPV projects among system builders Amonix, SolFocus, Concentrix, Opel and Emcore. PPAs have been signed by utilities like Southern California Edison for tens of megawatts of CPV power. And it would appear that at least one of the CPV semiconductor startups has managed to make some progress on the efficiency front. Solar Junction, an up-until-now stealthy CPV semiconductor startup, has made their first major commercial announcement in an exclusive to Greentech Media. The firm will soon be announcing an NREL-verified efficiency of 40.9 percent for their triple-junction solar cells. There are are a lot of efficiency announcements in this vein -- typically for hero cells of small size on a select group of chips. And even those inflated numbers seem to have plateaued (see the good old efficiency table below). But Solar Junction's close-to-record-setting achievement is for a standard design 5.5-millimeter production cell, manufactured entirely in-house on their production line in San Jose, California. And that could be a big deal. A CPV expert, preferring to remain anonymous, told me that if measured at standard conditions, "[T]his means that Solar Junction has basically duplicated the best performance previously announced by Boeing, Spectrolab and Emcore," adding that Solar Junction's approach is a bit different -- they are using different III-V semiconductor alloys, so their approach might be more readily manufacturable. Nancy Hartsoch, Chairman of the CPV Consortium and VP at SolFocus, had this to say: "Advances like this one by cell suppliers such as Solar Junction are very exciting for the industry, as increased cell efficiency makes a significant impact on reduced LCOE from HCPV systems. The ongoing advances in cell efficiency from the 39 percent range of last year to nearly 41 percent is evidence of the headroom which drives the rapidly reducing cost roadmap for CPV. While there have been higher efficiencies reported in the lab for some time, we believe that the 40 percent barrier has been passed with production-line product by multiple suppliers, providing a very robust supply chain to system manufacturers." And an investor colleague with deep experience in CPV had this to say: "I think this represents a great validation of Solar Junction's technology platform. The fact that this demonstration is on a production cell rather than small-footprint hero cells is impressive for the company at this stage and means that we can expect more interesting results in the future. Along with scale, cell efficiency is a key driver for CPV costs and can accelerate adoption in the market, as well as increasing reach to high-value, lower DNI areas." Other developers of CPV chips include established vendors Emcore, Spectrolab, Azure Space and newcomers like JDSU, Cyrium, Spire, Semprius, and QuantaSol. Draper Fisher Jurvetson, Advanced Technology Ventures and New Enterprise Associates are investors in Solar Junction and have put more than $20 million into the firm. The startup has also received $3 million from the DOE's solar incubator program. Solar Junction's technology genesis is from the labs at Stanford University, where VP of R&D Homan Yuen developed the one-electron-volt (1ev) bandgap platform in a lattice-matched material. Many of the record-setting efficiency cells use metamorphic or non-lattice matched materials. At this point, the good people at Solar Junction spoke to me very slowly and told me that, "Lattice matched is good." Lattice matched means that the boundaries of different semiconductor materials, their junctions, don't strain or shift during operation. It's an indication of the structural compatibility of two materials. Strain at that materials boundary can cause dark-line defects and other faults that negatively influence the performance and lifetime of these sophisticated solar cells. Efficiency is always important in photovoltaics but probably even more important in CPV. According to the firm, a one percent improvement in efficiency at the cell level can result in a three percent to four percent reduction in the cost of the system -- and further improvements could improve cost in an accelerated, non-linear fashion. Jim Weldon, the CEO of Solar Junction said that they were "delivering on the efficiency promise they made when they started the company." He spoke of an efficiency road map that reaches up to 50 percent in lattice matched cells. Nancy Hartsoch, VP at SolFocus, estimates that the amount of CPV shipped in 2010 will be 12 megawatts to 15 megawatts with an "installed base of about 8 megawatts." She suggests that 2011 will see 100 megawatts shipped, a substantial growth curve. According to a soon-to-be-released CPV report from GTM Research, annual CPV installations will grow from 2 megawatts in 2009 to 750 megawatts in 2015. Those numbers suggest that the market will more than double every year for the next six years, growing much faster than the PV market as a whole. If these predictions prove accurate, 750 megawatts of CPV in 2015 would account for about 2.5 percent of the total solar PV market, meaning that CPV would remain a specialized solution suited for locations with poor water resources and high DNI. This is an aggressive forecast and will require the cooperation of developers and banks in accepting the LCOE and reliability projections of the leaders in CPV. 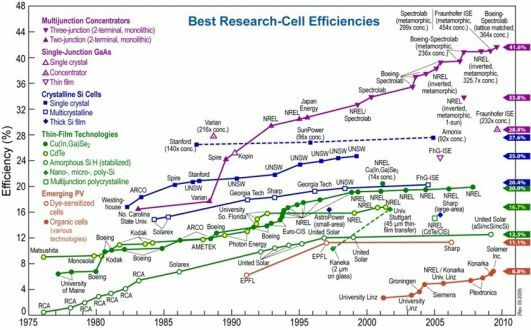 And additional progress in cell efficiency will certainly help as well.